Gorgeously golden and astonishingly sweet. These delectable tomatoes ripen early for so large a fruit. This Burpee exclusive features clean, bushy, plants that are quite disease resistant and set very heavy crops. Even in hot weather watch for Tangerine to be ready for harvest in about 68 days. Fruit Weight The average weight of the fruit produced by this product. There are two types of growing habits for tomatoes- Determinate and Indeterminate. Learn the differences of each type and why each might be best for your garden. 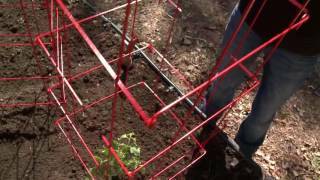 Learn the basics of planting tomatoes including staking and caging. Supporting your tomato plants will give your garden maximum growth and yields. Select a location in full sun with good rich moist organic soil. Make sure you did not grow tomatoes, peppers, eggplant or potatoes in the bed the previous year to avoid disease problems. Tomatoes should be set 30-48 inches apart in a row with the rows spaced 3-4 feet apart. It can be tempting to space tomatoes more closely at planting time, but if you plant too closely you will increase the chance of disease, and decrease yields. Tomatoes can be planted deeply, with the stem buried to the first set of leaves. The more deeply they are planted the more roots will form, providing the plant with additional support and better ability to take up nutrients. Some gardeners plant tomatoes by digging a horizontal trench and laying the plant in the trench with the top 2-4 inches of the plant pointing upward. Fill the planting hole with soil to the top and press soil down firmly with your hand leaving a slight depression around the plant to hold water. Use the plant tag as a location marker. This is particularly important if you are trying different varieties. It is very difficult to tell which variety is which from the foliage. Mulches also help retain soil moisture and maintain even soil temperatures. This is especially important for tomatoes as their roots may be easily damaged when weeding, and this can lead to blossom end rot. Keep plants well-watered during the growing season, especially during dry spells. Plants need about 1-2 inches of rain per week during the growing season. Use a rain gauge to check to see if you need to add water. It's best to water with a drip or trickle system that delivers water at low pressure at the soil level. If you water with overhead sprinklers, water early in the day so the foliage has time to dry off before evening, to minimize disease problems. Keep the soil moist but not saturated. If growing on stakes: As the plants grow, allow only one or two main stems to grow and pinch out any other side shoots as they form. Gently tie the one or two remaining shoots to the stake; don't pull them tightly against the stake. If growing in cages, no pruning is necessary. Whether to remove the side shoots, or suckers, that grow out of the leaf axils or not depends on the support system used. Gardeners using stakes usually snap off these side shoots. They typically get earlier and larger tomatoes but overall production tends to be less. If tomatoes are grown in cages, the suckers are generally left on, although it's a good idea to pinch the tip out of them when they are 6-8 inches long. Regardless you may want to remove all the growth from the bottom 6-10 inches of the plant. This helps to improve air circulation and reduce the spread of diseases such as early blight. Wait until the plants are knee-high. In the morning when the plants have the most water in them, snap off the lower growth while it is small. Any plants that look sick with distorted foliage or have a mosaic pattern on the leaves should be removed as they may have a virus that can spread to the other plants. It is best to do this early in the season. Determinate tomato plants ripen a heavy crop over a few weeks. Indeterminate varieties bear fruit continuously until frost. Remember that the days to harvest refers to the time from setting out transplants in the garden. Pick tomatoes when they are as ripe as possible. They should be fully colored and firm and picked regularly to avoid overloading plants. At the end of the season, when you know there will be a frost, pick all the almost-ripe tomatoes you can, and ripen them in brown bags or spread on newspapers at room temperature. Many cultivars will store for months. Store only sound fruit, at 50-60°F. Do NOT refrigerate and try to avoid having the fruit touch each other. 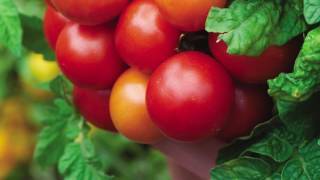 The foliage of tomatoes is toxic and should not be eaten. Tomato fruits are enjoyed in many cooked dishes as a flavoring. Use them to make soups, sauces, stews, ketchup, paste, juice, quiche, and pies. Add them to curries, casseroles, and chutney.